From July 2016 till June 2017, Sheffield housing market witnessed a 3% rise in prices. Compared to Brighton, where the property prices rose by 9%, or Leeds with its 6% property price rise, this is a fairly slow increase. Overall, an average price change in the UK and Wales is 2%. Sheffield with an average property price of £160k is also the 16th most affordable place to live in the England and Wales. The average property price for England and Wales is currently £283k. The most sold properties in Sheffield were semi-detached houses. In the past year, 6,5k semi- detached houses were sold for the average price of £142k. Terraced houses are also quite popular in Sheffield, 4.9k of this type of housing were sold, which represents 28.6% of all sales. The third largest volume of sales, 24.1%, are detached houses with 4.1k sold. On the contrary, flats comprise a minority of sales, only 9.3% or 1.6k flats sold. The most pricey neighborhoods in Sheffield are Coal Aston, Dronfield, Dronfield Woodhouse, Holmesfield, Unstone, North East Derbyshire with the average price tag of £489k, more than 300% of the average Sheffield property price. According to the 2011 Census, there are around 800 properties and a population of almost 2k. 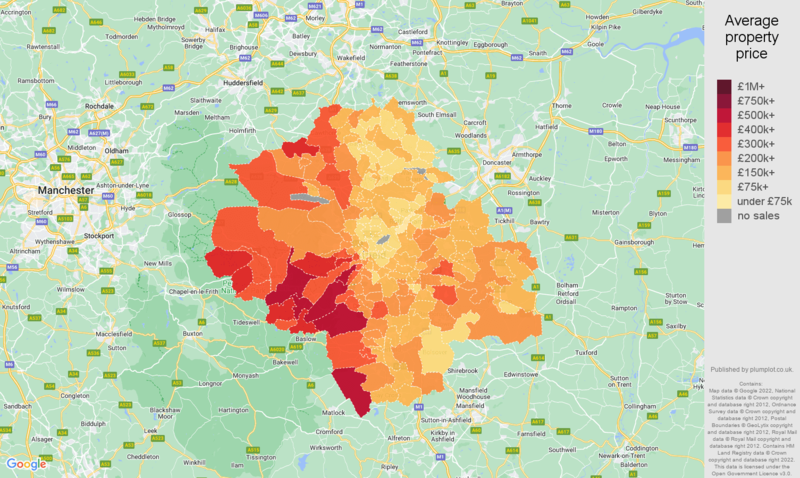 The second-most expensive area is the S32 3 postcode that covers the areas of Calver, Eyam, Grindleford, Hathersage, Stoney Middleton, and Derbyshire Dales. On the opposite end of property prices scale, the most affordable areas are at the S65 1 postcode sector, which covers the areas of Herringthorpe, Ravenfield, Thrybergh and Rotherham where an average property costs £54.6k, that is 34% of the average Sheffield price. According to the 2011 Census, there are over 2,000 households with a population of about 6k. The most common price range for property sales in Sheffield is the £100k-£150k range with 5.3k properties sold which comprises of 30.9% of the market share. The second price range with the highest number of properties sold is the range between £50k and £100k with 4.5k properties sold which comprises of 26.3% of the market share. A vast majority, over 90% of sold properties are in established properties, only 7% in newly built properties.